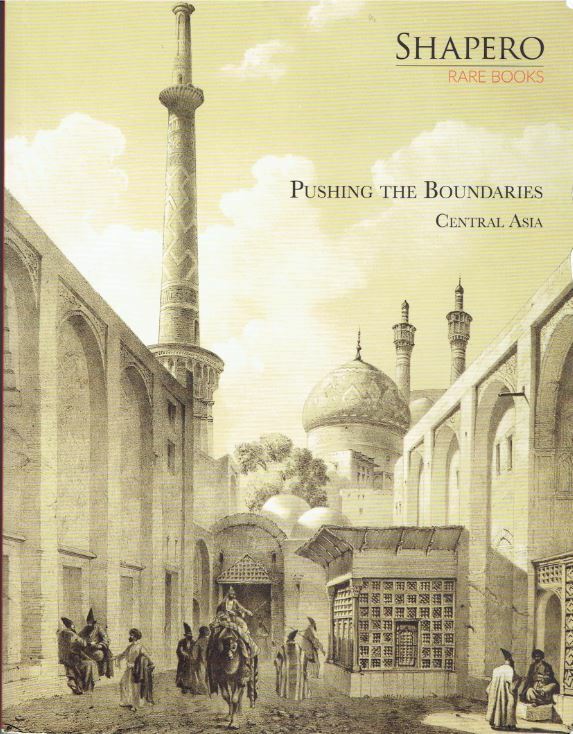 Shapero Rare Books has published a catalogue entitled Pushing the Boundaries Central Asia: From the Southern Provinces of Russia to the Sea. Most of these are travel books. Englishmen and Europeans write of their journeys to Central Asia. Some were more exploratory in nature, but others were accounts of people who simply had to get from one place to another at a time when the journey itself was an adventure worthy of writing a book. Shapero being an English bookseller, the largest group of books are English and many of those relate to trips to India when that large territory was a British colony. There is also a selection of Russian books, trips within the homeland by Russian writers, but we will not describe them in detail as they have cyrillic titles. Here, now, are a few samples from this new catalogue. Jean-Baptiste Chappe d'Auteroche was a French explorer noted for his voyages to view the transit of Venus. The transit is when Venus passes in front of the sun, and from it, it is possible to compute the distance from earth to Venus if the transit is observed from various locations. From this, it can further be computed the distance between the various planets and their distances from the sun. At the time, astronomers knew the relative positions of the planets, but had no real idea of what the size of the solar system was. However, transits are rare events, and follow an unusual cycle. They occur eight years apart, but the next two come over 100 years apart. The result is that when astronomers knew there would be two in the 1760s, they had to act right away. Chappe is best known for his voyage to Baja California to view the second of the pair, which occurred in 1769. He made it just in time, only to die of disease two days later. Less well known is he also went to see the first in 1761, watching it from Siberia. Item 34 is his account of the 1761 trip, Voyage en Sibérie, fait par ordre du Roi en 1761... published in 1768. This is not a book merely about the transit but one of the best descriptions of the people and resources of Siberia. Chappe describes the climate, fauna, minerals and more about the land, along with providing his sociological commentary. It was not very complimentary about Russian customs, which reportedly angered Catherine the Great. The second part of the book contains the first complete English, or any European language translation of an early book by Russian explorer Krashenninikov, which describes Kamchatka along with much material on Alaska and the northwest coast of America. The book also contains numerous plates and maps. Priced at £10,000 (British pounds, or approximately $13,166 U.S. dollars). Here is a book by another long ago visitor to Siberia who also went for a specific research purpose, but ended up telling us about the land and its people. Adolph Erman accompanied the Norwegian expedition to Russia and Siberia in 1828. He went there to observe the geography, and in particular, the terrestrial magnetism. Item 50 is the first English edition of his account published in 1848, Travels in Siberia: Including Excursions Northwards, Down the Obi, to the Polar Circle, and Southwards, to the Chinese Frontier. Erman continued on alone farther than the expedition, eventually circling the globe by sailing the Pacific via South America. £850 (US $1,120). Afghanistan has long been a crossroads between East and West, and not a good one. It has been the source of numerous wars between Russia and the West as each sought influence in Central Asia. In the 1980s, we were effectively at war with the Russians by supporting their local opponents. Today, we are not fighting the Russians, but certain local opponents combined with extremist Islamic groups. These wars rarely end well or for long, and America has avoided a bad ending this time by prolonging the battle indefinitely. James Atkinson accompanied the British in their first of three Afghan wars as a surgeon. He did bring back something positive. He was also an artist and he produced the artwork for this book, Sketches of Afghaunistan, published in 1842. He drew these pictures on the march to Kabul. Atkinson returned home in 1841 and it proved to be an incredibly fortunate move. The following year, 16,000 British soldiers and civilians were killed crossing the high mountains in an attempt to escape from Kabul. Item 20 is one of the rare deluxe copies with the hand-colored lithographs mounted on card stock. £30,000 (US $39,569). Here is a book that describes the big power rivalries in Asia during the 19th century, England and Russia in Central Asia. It was published in 1879. The author was Demetrius Charles Boulger, a noted British scholar concerning Asia and the Middle East. Those two nations were constantly vying for power along the northern border of India, which is why the British kept getting into wars in Afghanistan. They wanted to prevent the Russians from getting too close to the border of their Indian colony. Item 26. £2,500 (US $3,300). Next up we have an account of a Residence of Eight Years in Persia. The author was Justin Perkins, the "Apostle of Persia." Perkins, a Presbyterian minister, was sent to Persia in 1833 as a missionary by the American Board of Commissioners for Foreign Missions. He was the first American missionary to the region. Perkins remained there for over three decades. It was a hard life, six of his seven children dying of disease in Persia, but still he soldiered on, building schools and medical facilities for the locals as well as ministering to them. Though Persia was a Moslem land, Perkins worked with a small remnant Christian community, the Nestorians. They were descendants of a schism in the church dating back to the fifth century, when Nestorius, Archbishop of Constantinople, taught some doctrines unacceptable to the church. He was condemned for heresy and removed from his position. His doctrines were rejected in the West, but continued to be followed by a remnant of the Church of the East. This book was published in 1843, fairly early on in Perkins' mission. Item 86. £1,000 (US $1,320). Shapero Rare Books may be reached at +44 207 493 0876 or rarebooks@shapero.com. Their website is www.shapero.com.